Avery Elle: Ellen Hutson Watercolor Blog Hop! Hello! We are so excited to be hopping along with our friends at Ellen Hutson today. We are featuring projects using our NEW Liquid Watercolors and are SO excited to show them off in action. Avery Elle's liquid watercolors come in 10 gorgeous shades that can be used on their own or easily mixed together to create custom colors. For an intense shade use the watercolors straight out of the bottle. If you want lighter shades, just add various amounts of water to get the color you desire. The possibilities are endless. Be sure to check out all of the details of the hop as well as how to be entered to win one of TWO FULL SETS of our Avery Elle Liquid Watercolors over on the Ellen Hutson Classroom Blog. I painted our watercolors onto a watercolor paper die cut panel and set it aside to dry. In the meantime, I stamped images from our Toucan Party clear stamps and die cut them with the coordinating die set. I stamped and embossed the sentiment onto a strip of black card stock and adhered everything together. A few Ebony Black Nuvo Crystal Drops finished the card off. Thanks for stopping by for a peek. You are off to Julie Ebersole next. A full list of the hop participants can be found below. I am currently playing at watercoloring. Playing is a word I use when I think I have the hang of something but probably not. Also so I won't stress about it.I practice in coloring books and my art journal. I love the bright and vibrant colors you can achieve with them.! Awesome rainbow for your birds! I love playing with watercolors too. I love that rainbow background and the toucans are so cute. Love the soft look that was achieved with the liquid watercolours. Beautiful rainbow background on your card. Cute birds! Sooooo pretty!! Love the colors! Very pretty card, I like the contrast of the uncolored birds. Fun and happy water colored rainbow! Perfect backdrop for the super cute Toucans. I’ve always been afraid with watercolor but I think you make it look so easy this way. I really need to try it! Super cute! !, love the rainbow background paired with the black/white toucans!! Love the easy flow of these watercolors! Thanks for sharing. Love dabbling with watercolors - would be very excited to try these new liquid colors! 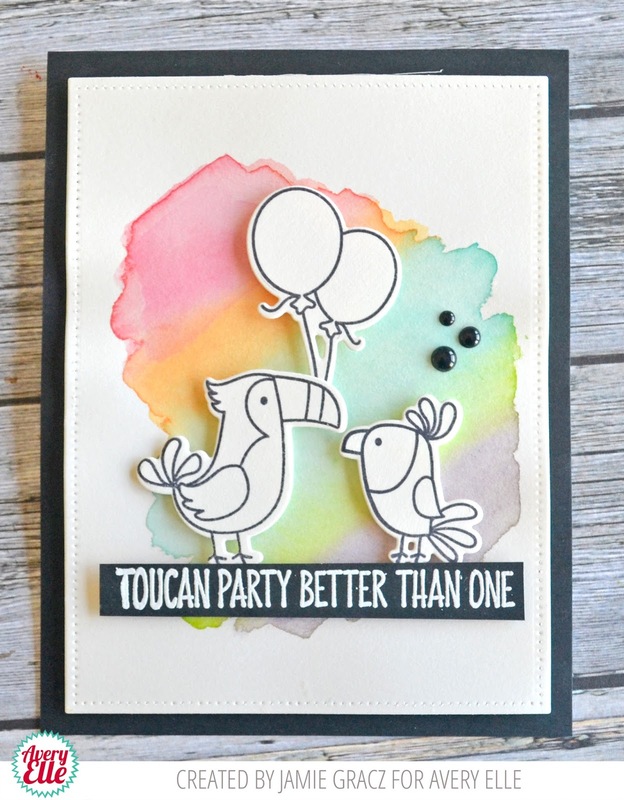 Such a cute card - love the toucans and the sentiment and love the watercolor background. I love this! Making the background the bright colors rather than the toucans. Very nice! Love the pretty rainbow scene in the background. So many times we get caught up in coloring in an image. This really opens my eyes to see that the background can be the focus. Thank you!! the black and white birds are perfect for that lovely background! Such vibrant colours with these watercolour's, I'm new to water colouring so these would be great to get to play with also and maybe master. I have never used liquid watercolors, but these look like fun. Thanks for sharing! Excited for these liquid watercolors, I would like to give them a try! This is such a pretty background! Excited to see more with these! These colors are all so pretty. I like watercolor paints. The card you made is so cute. I’m not always into cute but I have to say this one was adorable. I am just beginning to water color. Can't even say play yet. Love the look of it though. Love those Toucans. Beautiful colors that show off the toucans! This card is seriously too cute! Love that simple background and the soft watercolors. This looks like a great product. Very pretty and such a cute stamp! These watercolors looks like so much fun!! Love this card! This is adorable!! I love the background with the black and white birds! Oh, I love the new product! Such pretty colors. What a fun blog hop! Loving the samples. A darling card! Love the saying & the gorgeous coloring! These colors look like fun to me. Can't wait to try them! I like this idea of keeping the images white. Very cute! Lovely and simple watercolor background on your cute card! What a lovely and adorable birthday card. The watercolored background is fabulous. This is seriously cute. Love your background. I love playing with inks and colors, the more vivid the better. Very pretty watercolor background for these adorable toucans. I love the background against the black & white toucans. Great inspiration. Thank you. Like the soft colors and the rainbow. Love that pretty, soft background! Can't wait to try these liquid watercolors! Ooohhh ! I love that colorful background when the focus point is black and white ! Wonderful background paired with those so cute birds! I just adore the way that you can use these watercolors. What an amazing card and use of this medium. I love to watercolor on my card but really struggle getting soft colors with what I have - they always look too washed out for some reason. Everyone I'm seeing using these Avery Elle colors seems to be getting lovely soft yet still vibrant color using this product. I think I need to get some for myself to try them out! So helpful to see them put to use on this blog hop today! Such a beautiful palette of colors. The designers in this hop are singing your praised and I can see why. Amazing works of art being created! Cute toucans. Love your beautiful background. I love watercolouring so these new products look so fun and exciting. Love the soft rainbow. Oh, I love how this card shows how well the colors blend nicely into each other. Will be fun to experiment with. Love these birds! They are so cute and the background is so pretty!Beautiful job! Beautiful soft colors! I've never used liquid water colors. I'm intrigued! The liquid watercolors look like a blast to use and your card is so adorable! Love that rainbow background. So unique. A great card! These pretty watercolors look like a lot of fun to use and I like that they come in the little bottles. Love all the colors of the new watercolors! Beautiful card! Wow! Beautiful rainbow background!!! Gorgeous card!!! I really have to admit how surprised I've been at seeing the lovely soft colors the designers can get with these liquid watercolors. It's really a lovely look and one that for some reason I struggle to get with my everyday watercolor palette. I'm looking forward to trying these - thanks for putting together such a lovely color selection for the first release!